Why it matters: CES is still a few weeks away, but companies are already giving us sneak peaks of what they’ve got in store. One of these is LG, which is set to unveil the second-generation of its CineBeam Laser short throw projector that was revealed at this year’s event. Like its HU80KA predecessor, the HU85L’s Ultra Short Throw technology lets you project a massive picture onto any surface—wall, floor, or ceiling. Users can create a 90-inch image when placing the device just 2 inches away from a wall, or increase this to 120-inches by moving it 7 inches away. 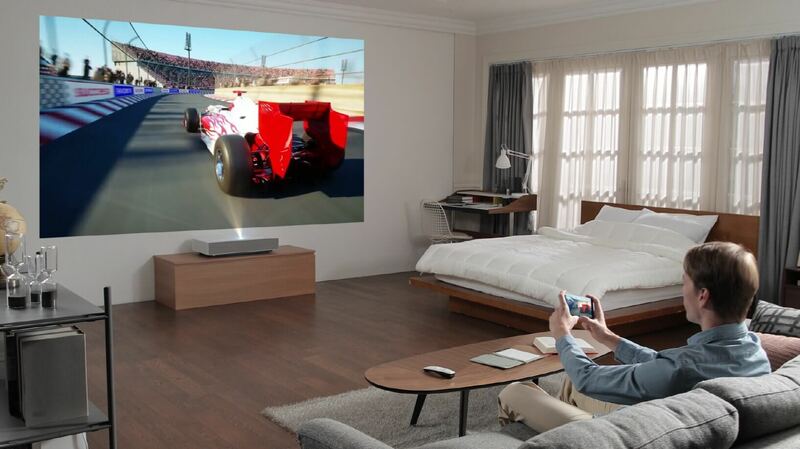 In addition to the usual USB, Ethernet, and HDMI connectivity options, the projector comes with LG’s webOS 4.5 operating system, giving you access to the likes of Netflix, Hulu, and other streaming services. There’s also wireless support for external devices such as a keyboard and mouse. Like its modern TVs and Smartphones, LG’s ThinQ AI technology is integrated into the projector, allowing you to set commands by speaking into the ‘magic remote.’ Users can, for example, say “turn off the projector after the movie has finished,” or ask for certain content to be shown. No word yet on the release date or price, but it will certainly be cheaper than a similar-sized OLED TV. For comparison, the HU80KA, which can project a 150-inch screen and has HDR, had a $3000 price tag at launch. We'll find out more at CES, which starts on Tuesday, January 8, 2019.